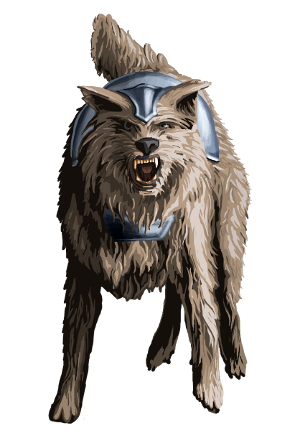 The War Hounds are proven fighters, and highly valued. They have been equipped with some steel plates, and have a small torch of burning tar affixed to their backs. The torch was originally an anti-horseman strategy; the dogs were supposed to run under the horses, burning the girth and causing the horse to throw its riders. But it took too long to train the dogs to overcome their fear of being trampled, so the torch was just attached to the armor of the War Hounds, to burn any foe that gets close to attack (so it is for defense only).